Preheat oven to 350 degrees and set rack at the middle position. Spray a 9-inch or 10-inch deep dish pie pan with cooking spray. Remove pie crusts from refrigerator at least 15 to 20 minutes before using. Gently unroll one crust onto floured cutting board or table. Lightly dust both sides of the crust with four. Carefully place the crust inside the pie pan, leaving at least 1-inch of the crust overhanging. Pierce bottom of crust several times with a fork. In a large mixing bowl, whisk the 3 whole eggs. Add corn syrup, butter, brown sugar, vanilla extract and bourbon. Stir until well blended. Add chopped pecans and stir until combined. Set aside. Unroll second pie crust onto lightly floured board or table. Lightly dust both sides of the crust with flour. Using leaf cutters we found at Williams Sonoma, cut enough leaves to go around the outer edge of your pie. Place cut leaves on waxed paper. If you are using a scalloped pie dish, it will take approximately 30 leaves; fewer if using a standard round dish. Pour filling mixture into pie crust. Using the reserved egg white, gently brush the back side of the pastry leaves. Brush the outside ¼-inch of the pie crust with the egg wash. Place leaves around crust, overlapping slightly. Press gently to adhere. Brush egg wash over the leaves. Bake for 45 to 55 minutes until pie is set; pie should have a gelatin-like consistency. A knife or straw inserted halfway between the center and the edge of the pie should come out clean. Check the pie after 30 minutes of cooking. If the crust is browning too much, lay a piece of aluminum foil loosely over the pie. Remove pie from the oven and cool on a rack. Pie should be completely cool before slicing. Top with a dollop of whipped cream, if desired. Here in North Carolina we often top our pecan pie with homemade vanilla ice cream. Some years we have a bumper crop of pecans here on the farm at Big Mill Bed & Breakfast and, oh, they are good! Luckily a few are falling early – usually they wait and fall when it is 20 degrees outside. 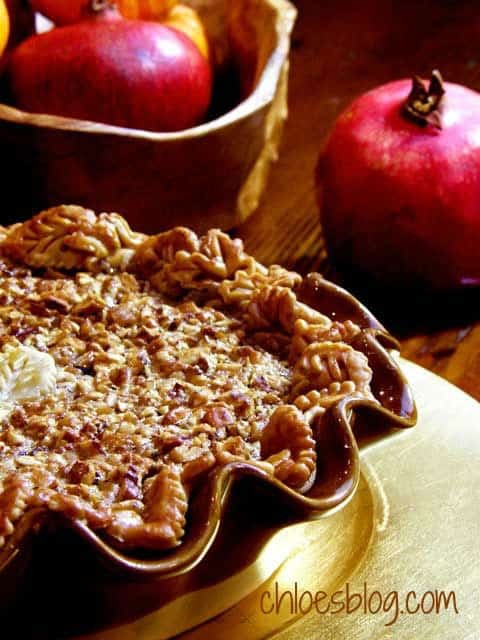 Cathy Roberts makes this sumptuous pie and with a little begging she shared her Pecan Pie Recipe with us. 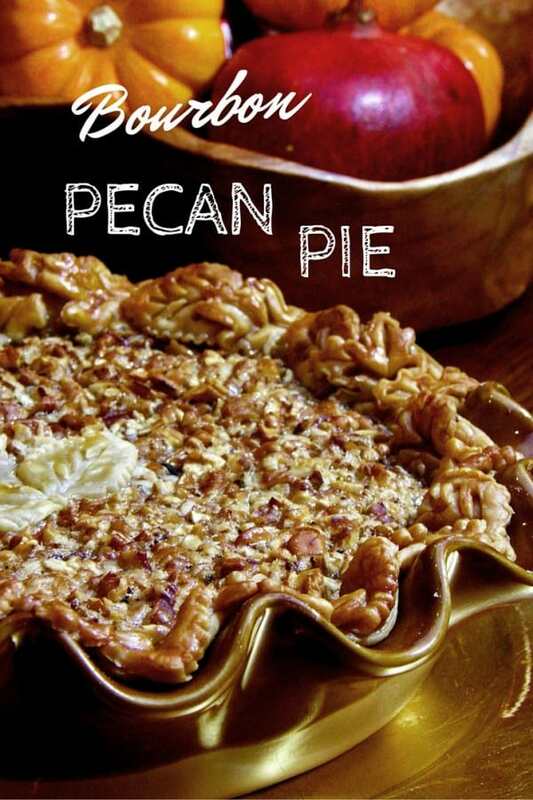 This is as good as it gets in the old south — Bourbon Pecan Pie.